Having been involved in organising the South Bank Arts Trail for five years, I have been looking for a ways to develop new community arts based events. The big difference being that I’d like to retain more creative control, be funded to do it and be able to pay artists to be involved. Jess Wright was in a similar situation, having run the South Bristol Business Awards for two years she was looking for a new challenge. We share the same aims but come from different backgrounds:art and business. Seven months ago Jess and I started working on a new project called illuminate. Illuminate aims to produce arts-based events that promote and reflect both the creativity and rich history of South Bristol. Key elements of illuminate projects will be the use of disused properties to show art/moving image work, to reflect the community and history they are set in and to involve key creative organisations in the city of Bristol. 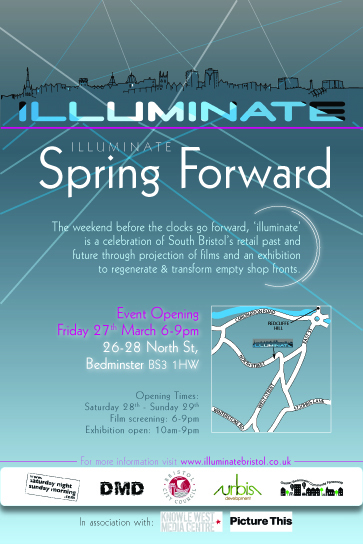 The weekend of March 27 to 29 will see two empty shops – numbers 26 and 28 in Bedminster’s North Street – playing host to illuminate’s first event ‘Spring Forward’. Number 26 will feature a series of projected films made by Bristol based artists alongside an exhibition in the empty property (no.28) next door. The exhibition celebrates the past and present of Bedminster’s retail history.